Written on February 29, 2012 at 12:46 am by Air Coole VW Love! I pulled out the fuel tank and discovered it had rusted out. The bottom was very thin and there were numerous holes, eaten away by old fashioned oxidation. After a time even fuel will turn into mostly water and then begin to eat and corrode at the tank. If you’re going to put a vehicle into long term storage it’s a good idea to remove the fuel. I checked around and learned that I was going to have to pay about $130 plus shipping for a replacement tank. I told my wife that I was going to use one of those red fuel cans instead. Spend the money on more important parts. Besides, I’d be 5 gallon tank and mobile. If you live in a rough neighborhood you could take your gasoline in with you every night! As if it had been intended, I was checking the newly listed items in the Samba classified ads and found the fuel tank I needed for under $60 with shipping and all. 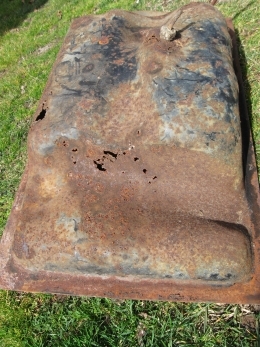 I got a salvaged fuel tank from a 67 Beetle instead of a new after market ‘cheapy’ for almost $140 or more after shipping. I was happy. The same guy also had the hood pull which I had to replace. A nice score I thought. I don’t intend to restore this car professionally and completely or to return it to full stock and original condition. I would rather have the original type fuel tank though, especially when I can find a deal. I want to keep it as stock as possible and as time goes by I will continue to improve the car as money and situation allows. When it comes to parts my main concern is to avoid Chinese made products. I will try to get German or even US when I can and will not intentionally buy the Chinese. Recently I bought a distributor cap and rotor button made in Spain, contact points made in Brazil, and a condenser made in Turkey. All were in Bosch boxes. My immediate goal is to get this bug into ‘functional, safe and running down the road’ shape. I plan to drive this car and have some fun with it. I’m not going to park it and work on it for years until it is perfected. My first tasks are to repair the steering column and to re-do the brakes. I have new brake lines and master cylinder and will be needing 4 sets of shoes and hardware kits. The area under the dash where the steering column support is attached has rusted away. When I pulled out the fuel tank I could see the master cylinder. The reservoir was mostly off and laying to the side. 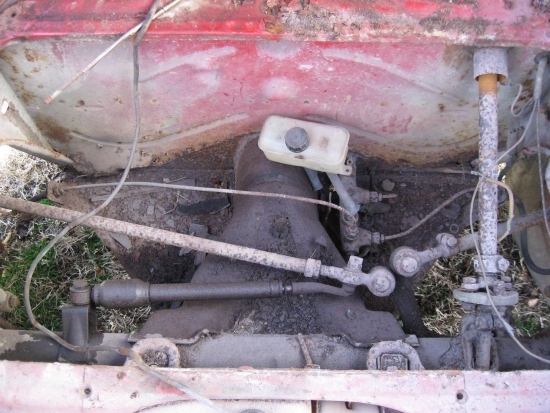 The master cylinder was in very bad shape, as were the lines. I knew then what the rest of the brakes probably looked like. Fuel Tank Removed. Tie rods, damper, master cylinder and steering column look very bad. I removed a wheel today and pulled off the drum. The wheel bearing seemed a bit loose. 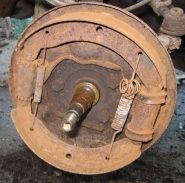 The brake shoes had disintegrated and actually fallen apart. The entire surface covered in dust and rust. I’m going to need some wheel cylinders too. Back years ago I use to see rebuild kits, I hope they are still available somewhere. Something else to add to the list. The drum looks good, other than the rust it seems in great shape. Of course I still have 3 more wheels to pull before I will know for sure but I am expecting similar with the other wheels. It may be best to go ahead and replace everything, but when you are on a budget you do what you can. I can see some new wheel bearings in the near future.